Today we'll take a look at whether you should host your online course on your own WordPress site, or use an online course platform like Teachable instead. Should you use Teachable or WordPress for your online course? If you're comfortable with designing your own website and configuring plugins, then WordPress offers a more flexible and cheaper option. But for beginners or those who don't want to set up all the tech themselves, then Teachable will likely be the better option. It's also possible (and quite a good idea) to use both; using a WordPress site for blogging, seo, collecting emails and creating landing pages, and then Teachable to collect payments and host/deliver your online course. A lot of people do this and I'll discuss why in more detail below. 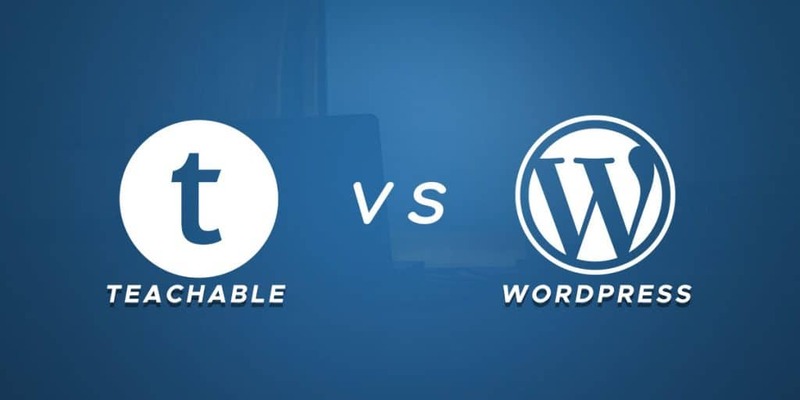 In this article we'll look at how WordPress and Teachable compare on various factors including price, design, flexibility, online course features, and more. Should I Use Teachable or WordPress For My Online Course? Deciding whether Teachable or WordPress will be a better solution for your online course depends on your specific situation. Using WordPress takes more time and requires a bit more technical knowledge. You're responsible for everything, including configuring whichever WordPress LMS plugin you choose, and collecting payments. You'll also need to deal with any tech problems that might arise and keep your plugins up to date. The big upside though is that it's cheaper and much more flexible. Online course platforms like Teachable cost a bit more, but most of the tech set up and maintenance is done for you. So it's easier, and if you take into account the time that you'd need to spend configuring and managing your own WordPress course site, many people prefer to go the simpler and quicker route and just pay for an ‘out of the box' solution. This option suits anyone who is relatively new and inexperienced at creating websites, or just wants to focus their time and energy on creating a great online course or selling and marketing it. There's no right answer to the question of which is best. For some people it will be WordPress and for others it'll be Teachable – it depends on a range of factors including your existing skill set, the time you have available, and which features matters most. The aim of this side by side comparison is to show you the pros and cons of each option and help you make the right choice for you and your situation. So, let's take a deeper look at WordPress vs Teachable for hosting your online course, using a few different metrics to see how they compare. Teachable will cost you between $39 and $299 per month. On their lower tier plan, you'll also pay 5% of your course sales as transaction fees and get fewer features. Teachable also has a free plan, but the features are limited. 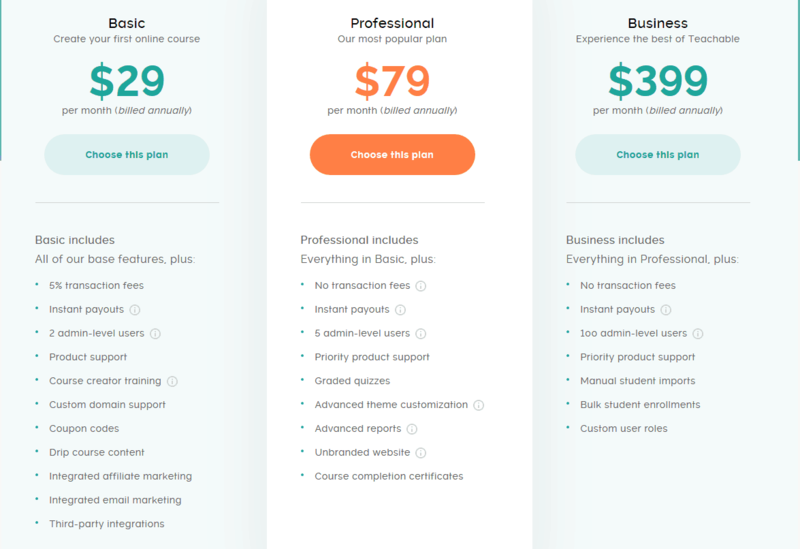 So if you're serious about making and selling a quality online course, then I'd recommend going with the Professional Plan which costs $79 per month, billed annually. That's $948 per year. This might sound like a lot, but if you focus your time and attention on creating a great online course that you know people want and you do a good job of marketing it, then you could end up making tens of thousands a month in revenue – so the cost of having an easy to use platform can be more than worth it. WordPress LMS plugins (learning management systems) like LearnDash or Wp Courseware start at around $149 per year including support and updates. Some plugins even give lifetime access for a one-time fee. If you decide to host an online course on your own website, you'll also have to pay for a domain, website and video hosting fees, which will be at least an extra $150-200 or so per year. Plus you'll likely also need a landing page builder like Thrive Architect or Leadpages to create a good sales page and collect email addresses which will cost at least another $70 a year. (I'm going to assume that you'll use a good email service like Convertkit whether your on WordPress or Teachable, so we won't count the cost of this in the comparison). So, all in all, to host your online course on WordPress will usually cost around $300 – $450. So why will hosting your course on Teachable cost you 2x what it would cost to do yourself? Online course platforms offer unlimited hosting, easy course creation and layout, and a number of marketing and selling features all in one convenient place, ready to roll without too much set up and customization. It's one fee to one place, and everything under one roof, making it easier and more convenient to get set up and to run. Creating your course on WordPress is cheaper but it will cost you more time to set up and install plugins, create your course layout, payment gateways and more. Plus you'll be in charge of managing it going forward. A huge advantage of WordPress is that the options for editing and customizing your site are almost limitless. There are so many plugins and themes out there that you can tweak your site to get it exactly how you want it. There are 2 main pages where design really matters for your online course: the student dashboard and your sales page. Check out these 2 examples of the student dashboard design from 2 different courses built using the Learndash WordPress plugin. 2 Examples Of The Student Dashboard from courses built using LearnDash, the WordPress plugin. WordPress will also enable you to build a completely custom sales page using a landing page builder. Nice design to suit the brand and audience and the fact it's fully customizable means you can really get it as you want and tweak it over time to optimize conversion rates. Even a small change to your landing page can significantly boost conversion and increase your overall sales. So being able to change your layout in minor ways and perform A/B testing can really help in maximizing the success of your course. WordPress makes those tasks very easy, as long as you have some experience building and designing your own websites. In contrast Teachable offers more of a fixed template, and you don't have nearly as much ability to edit the structure of how your course or landing pages look. It's not the most beautiful of designs – built more for functionality than visual aesthetics. I expect this is something that Teachable will upgrade in the months and years ahead as it's a simple thing that would make a big difference, and rival competitors like Kajabi offer much better designs so they'll need to upgrade it to stay popular. Although customization is limited, you can change the colours, text, logo, add images and course description etc. Only being able to use templates could be seen as limiting, but it also reduces the number of choices and workload. For beginners this can actually be a good thing, because making your website from scratch can be a confusing and overwhelming process. If you have limited design or coding knowledge, I wouldn't look at this as a drawback to Teachable's platform necessarily. Teachable's goal was to make a platform for people to sell online courses without needing to worry much about the design and technical side of things, and in that sense I think they're a great success and they offer a fantastic solution for people who want to go the easy route and focus on creating and selling their course, without getting caught up doing lots of design customization. But if you're used to creating your own designs and layouts, then you might find Teachable a little limiting because you won't have the same flexibility to move things around and make it look exactly as you wish. This is probably one of the biggest drawbacks I think that third-party online course platforms like Teachable have – not being able to tweak things as precisely as WordPress allows. Aside from enabling you to create exactly what you wish, customizing elements of your sales page for example can sometimes also enable you to optimize your conversion rate. With WordPress you'll be able to use a drag and drop page builder if you want to move everything around, add nice design features and make it look exactly as you wish. When it comes to design it basically depends what you want: do you want 100% customization, or do you want quick and easy but with some limitations? What do you want to focus your time and energy on? I'd argue that your time is better spent creating your course, selling and marketing your course and engaging with your students and building a great course community. This is what will make or break your success as a course creator more than anything else. With your own WordPress course site, you have an almost limitless number of features that you can add or remove at any given time. With hundreds of plugins at your disposal, you can add all the latest widgets and gadgets to your website and if your LMS plugin doesn't have a particular feature you're looking for, then you can just use another plugin to bolt on top and add it separately. Teachable offers a wide set of features but they are bundled up in the different tiered pricing options. You can see what these are up front so you can make an informed choice about which plan is most suited for you. Each tier of pricing comes with a different range of features. The most expensive unlocks all features, while lower plans are typically more restrictive in what features you have access to. The downside of this is that it can mean you have to upgrade to a higher plan just to access one particular feature that you want to use. There are such a wide range of different features that you might come across on different online course platforms, whether on WordPress or with a hosted option like Teachable. Most platforms will offer all of these core options and other besides especially on the higher tier plans, so it's not like you're going to be left without core functionality with any option that you choose. However, if you really want a particular feature then it's worth looking at the Teachable features and pricing pages and comparing these against the WordPress LMS plugin you're considering to make sure you have this feature available to you. WordPress is used to create all kinds of websites, not just online courses. So if you don't know what you're doing, it may be difficult to figure out how to use it to sell courses. It takes a lot more work to set up all the themes, plugins, and other infrastructure you need before you can start selling your course on WordPress. If you decide to go with WordPress, first you need to buy a domain and web hosting. Then you need to install WordPress and find a theme. Then install all the basic plugins for SEO, social media, and site security. You'll need to evaluate which LMS plugin you want to use, buy it, and get it all set up. You'll also often need a separate membership plugin if your LMS plugin doesn't collect payments or if you want extra features like a community discussion board. And that's all before you even start uploading course content to your site, which will require customizing the layout and plugin features. In contrast, Teachable is much easier to set up and use. All you need to do is sign up and create an account to get started. Teachable offers video guides to help you get your school set up and they also have a really comprehensive set of written guides as well. The Teachable platform gives you the structure and functionality needed to sell your course, and all you really need to do is to upload your course content and pick from a few options on how you want things set up, where your payments are sent and to integrate with your email provider. This is really one of the biggest benefits to using Teachable over WordPress. It's what the platform was set up to achieve, and it does it really well. In terms of ease of setup and use, Teachable is clearly the winner. If you have your course videos ready to go, you could be set up and enrolling your first students in just a couple of hours. Plus managing your course business from there onwards is made super simple with all your marketing and sales tools in one dashboard. It's not quite as flexible as making your own site from scratch, but it's certainly capable of giving you a full-fledged course site that is visually appealing without any of the coding and web design hassle. WordPress on the other hand offers you loads of flexibility, but there's no doubt it's more difficult and time-intensive to set up and run. As your WordPress website grows, you're bound to go through some growing pains. When you start to reach the limit of what your shared hosting plan will support and begin to experience downtime, you'll need to upgrade to a better hosting plan. Often the jump from a shared hosting plan at a few dollars per month to the next level of hosting can be expensive. More students also means more administration. Both in terms of product support and dealing with refunds and other payment issues. Scaling up can also mean adding new course content or increasing your marketing efforts with additional free content. All of this is possible (and with complete flexibility) on WordPress, but the drawback is that you'll be the one who has to research the options and do the work. Scalability is a little easier to handle if you're based on Teachable. As your course grows, you can simply upgraded to a higher level plan to unlock more features. For $79 per month you've got unlimited hosting, integrated email marketing, and they even handle chargebacks if you use their integrated payment processing. It doesn't matter if you've got 1 student or 50,000 students taking your courses, you'll still pay the same flat rate. I think this is one reason that Teachable becomes an even more attractive option based on how many students are enrolled in your program. For a popular course it seems well worth their monthly fee for the unlimited hosting and payment processing alone. It all comes down to what kind of chanegs you think you'll need to make as you scale. If it's just a case of being able to handle more students, then Teachable will be an easier option to scale with. If you think you'll want to add more specific features, like a custom community forum for example, then WordPress will offer more flexibility to do this as you scale. PLus, if things are going well with your online courses then you can just hire a developer to do the heavy lifting. With WordPress, you don't really get any support from WordPress directly. Your hosting provider may be able to help with some issues related to hosting, or things like setting up an SSL certificate. On a WordPress site there's also less help to turn to when it comes to customization and design of your site. The creator of your theme may be able to help, but otherwise you might need to hire a third party to do some coding for your site. Teachable offers its users 24/7 support. If you run into any issues with their platform, just contact them via their online chat or email and they will usually sort it out for you pretty quickly. If you are on the Professional plan, you get priority support compared to those who only have the Basic plan on Teachable. Support is one of the other major benefits that Teachable offers over going it alone on WordPress. Because all the features are under one roof, the support system is set up to handle pretty much anything you might have an issue with. And because tens of thousands of fellow creators use the same platform, the chance are the issue has come up before and they are able to address it quickly for you. In terms of security, the Teachable platform is much more secure than the average WordPress site. As long as you use a secure and unique password, you needn't worry much about your Teachable course getting hacked. On WordPress I'd recommend taking extra safety precautions like using two-factor authentication, regular backups, and a plugin to limit login attempts. It's you who is responsible and will need to restore everything if your WordPress site gets hacked! Plus depending on the size of your site and the type of information you gather, this could even open you up to fines under the new GDPR legislation if any of your customers are from Europe. If you've had a WordPress site before, then you know what I'm talking about. I've only got about a dozen plugins on my WordPress site, but it seems like one of them is asking me to update it every couple of days. The more complicated your online course gets, the more plugins you'll likely want on your site. And having too many plugins from a bunch of different providers can conflict with each other, slowing down your website or breaking parts of it. Every time you update a plugin, there's the potential for it to cause a new conflict that causes another problem on your site. And you can't just choose to not update them, because out of date plugins represent a potential vulnerability or security threat to your site, and can also make them incompatible with future versions of WordPress. Most people who run their online course using a WordPress site have a couple dozen different plugins they use, so these compatibility issues are pretty common. A chunk of your time can end up being spent just keeping your site up and running and ensuring your students have uninterrupted access to their course. Teachable is the exact opposite of that. Their team handles all the maintenance and updates for the platform so you don't have to. Since their whole platform is designed in-house, it works together better and there are less random little issues that you run into when trying to cobble together a site using different plugins. That means more time for you to focus on creating your courses and promoting them. The easy of use (and not being the sole responsibility for the tech side of your course) makes Teachable the winner here as well. If you want a passive platform that you can leave for a month and be confident that your course will still be up and running, then Teachable can give you that peace of mind. If you don't mind keeping plugins updated because you're doing it anyway or perhaps you have a site manager who's in charge of this, then this may be less of an issue for you. WordPress is still the king when it comes to creating a blog and ranking in search engines. There's a reason why nearly 30% of all website on the internet run on WordPress. If blogging is a serious part of your marketing strategy, then WordPress is much more powerful compared to what Teachable offers in terms of creating blogs. You have flexibility in design and blog layout, sidebars to keep people on your site and optin forms that can be placed almost anywhere to capture email leads. Teachable offers some light blogging capabilities, but their offering is quite limited and I wouldn't recommend it for anyone besides complete blogging beginners, or if you only want to write the occasional post. That doesn't necessarily mean Teachable is out of the equation though. If you want to have a large blog and still use Teachable, I'd just recommend using WordPress to create your blog and then hosting and selling your course separately on Teachable (see below for more on this). WordPress + Teachable: Is This The Ultimate Solution? I personally think that just comparing Teachable vs WordPress is a slightly limited way of looking at it. There's no need for it to be one or the other. The ultimate solution for many people is to use Teachable and WordPress. That way you can still take advantage of the power of blogging and marketing with full functionality on WordPress, and then send people to your Teachable course directly from your blog posts or through email marketing to make sales. Your students can then enjoy a clean and simple student learning experience without you needing to configuring course plugins, payment gateways and keeping everything maintained and updated. This is how we run our online course at GroCycle and I have to say I really think it's the best of both worlds – especially as most course creators will already have a WordPress site with traffic and email capture set up before they start making an online course. This way, you can just bolt on the ability to make and sell an online course in the easiest way possible without too much time input and tech headache. Conclusion – Which One Should You Pick? Here's a quick summary of when I think you should choose a hosted platform like Teachable versus go for a self-hosted WordPress site.